Are you aware of how currency is traded and the fundamental factors that affect these currencies? Currency futures trading is yet another and lucrative instrument that traded globally. You might be wondering, who are involved in currency futures trading? How can you make a fortune out of trading in currency futures? From Central Banks, Business Houses, Banks, Travelers, investors, and of course traders across the world participate in currency trading. You can hedge and speculate to gain profits from currency fluctuations in the global economy. Currency futures trading is extremely risky and without proper knowledge and guidance, you will lose money easily. So, better educate yourself before you jump into currency futures trading. I expect that you are aware of futures trading in equity. So, without wasting time, let’s get straight to currency futures. Futures fundamentals remain the same and only the instrument changed. All you need is to replace equity and index futures trading by currency futures trading. We better know currency futures as FX futures or Foreign Exchange futures. Basically, it is a futures contract that lets you exchange one currency for another. You can do so at a specific time with an exchange rate in the future on the purchase date. You may shock to know that an average daily trading volume in the forex market is above $5 trillion. That’s why traders all over the world like it so much as it is the most liquid market in the world. You can do forex trading in mainly four major currency pairs that are most popular among the trader’s community. These are USD-EUR, USD-JPY, USD-GBP, and USD-CHF. Apart from that, you can also trade in USD-INR, EUR-INR, GBP-INR, and INR-JPY. Imagine you are on a trip with your family from the US to India. Perhaps you’ve made a forex transaction as the currency of both these countries are different. So, you’ve converted your dollars(USD) into rupee (INR). When you convert, the foreign exchange rate between the two currencies applied. Now, how many Indian rupees you get for your dollars will depend on supply and demand. At the time when I was writing this post, the value of USD-INR was around 72. That means for 1USD, you may get 72INR. As the exchange rate fluctuates continuously, so as the value of USD-INR. Suppose, you’ve exchanged $5000 on Monday and the value of USDINR is at 72. So, you will get 3,60,000 INR as 1USD values 72INR. So, you will get a lot of money to enjoy your holiday in India with your family. Suppose you’ve exchanged the same $5000 after a week and let say, the value of USDINR is at 60. In this case, you may get a lesser exchange value as 1USD values 50INR. So, you will get 60,000 INR less if you exchanged after a week. Although you can still enjoy that lesser amount as India is less expensive as compared to the USA. Having said that, this small change may not disrupt your holiday much. However, If you are doing export and import business, then it will make a big difference. So, you may pull back yourself until the forex exchange rate is more favourable. Businesses trade in currency or in the forex market to hedge their order book. However, as a trader, you can speculate the price movement of the currency pairs. Currency futures trading is highly leveraged because of the huge volumes and so participation comes from across the globe. You can trade in any currency pairs, just like stock and index futures. If you’re anticipating that the value of USDINR may go up, then buy USDINR futures. So, you may trade based on where it’s headed. It lets you find a buyer when you’re selling and a seller when you’re buying as currency markets are very large. So, you can trade on any stock exchange that facilitates currency futures trading. Forex markets are not centralized and there is no International exchange and so you can do forex trading at different exchanges. In equity markets, before initiating any trade, you set up your mind and goal. Either you are bullish or bearish in a particular stock or market. A particular stock either go up or go down. However, in a currency pair, you will have a dual view. Suppose when you buy USD-GBP, that means your view on USD is bullish and bearish on GBP. If you want to trade currency future successfully, then you must keep an eye on factors that impact on currency pair movement. Export and Import data are very essential for any nation especially if an economy reacts to trade deficit. For instance, U.S. imports more than 80 per cent of goods that roughly estimates around $2.4 trillion. It alone imports around $640 billions of capital goods like PCs and media communications gear, including electronic parts. The U.S. also imports services and talents that makeup about 20 per cent which stands $534 billion. Services include travel and transportation, IT professional, banking and insurance. To wrap things up, the taxpayer also supported organization imports. The USA exports near about $1.4 trillion from capital goods, crude oil to commercial aircraft. Despite the fact that America exports billions in oil, customer merchandise, and car items, it imports much more. So, while exporting goods and services to other countries, if the value of USD weakens then the USA may incur huge losses. In fact, an increase in imports makes the domestic currency weaker. Moreover, an increase in exports strengthens the domestic currency. When you import anything, then you need to pay in the international currency. So, if you are importing from the UK to the USA, then you need to sell USD and buy GBP. The transaction causes a demand for GBP and eventually strengthens GBP. Similarly, when you export any goods and services, you will receive GBP and then sell it to convert it into USD. So, exports make a USD stronger. Export and Import data’s are one of the key factors to track as it impacts the bearing in which the money exchanges. All in all, narrowing the exchange or trade deficit is positive for a nation. Basically, a trade deficit is a monetary proportion of universal exchange in which a nation’s imports surpasses its exports. A trade deficit actually represents an outflow of domestic currency to other markets. So, the U.S. will have a trade surplus if it exports more than imports. It is because of the inflow of currency than the outflow of currency. Inflation is a monster that eats away your wealth significantly. It is basically a parameter that helps you to know how much the price of basic goods and services enhances over time. If inflation enhances, then your living cost will also increase and affects your daily life. So, to keep inflation tolerable for you, Federal Reserve Bank in the US intervene and tweak the interest rate. When the inflation rate increases, then you can expect the Federal Reserve Bank to hike the interest rate. So, if the central bank of a nation increases the interest rate, then it will attract foreign investment. Eventually, it strengthens the domestic currency. Suppose Federal Reserves hike the interest rate and the interest rate is low in the UK, then pound will flow to US markets. In case, the interest rate is low, then domestic currency outflows to where the rate is high. So, always keep an eye on monetary policies before you trade in currency. Your view may be bullish on domestic currency if the interest rate increase as it will improve the inflows. On the other hand, if the interest rate is low then your view will change to bearish on the domestic currency. So, the interest rate is one of the crucial factors that really impact the currency pair price. You may find other factors like CPI, GDP, and much more that may impact the currency. I have listed some of them which I think will be handy before you trade. Having said that, I will add some more economical factors in my upcoming updates. Where To Start Currency Futures Trading? I believe you have got some idea about currency futures trading and how its price changes. So, to start with you need to open an account with forex brokers. Having said that, there are many forex brokers. 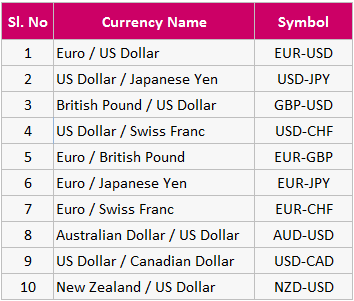 You can choose any one of them and start trading in currency pair of your choice. So, as a newbie trader, you can open an account in iForex, eToro, 24option.com, forex.com, and fxcm.com. You can also choose from global forex brokers xm.com, ironfx.com, Ameritrade, and octafx.com. However, if you want to trade currency pairs with Indian currency INR, then it is better to open an account with India based stockbrokers. You start with discount brokerage firms like 5paisa.com, Zerodha, and Upstox. Moreover, you can also opt for full fledge brokers like Sharekhan, Angel Broking, Motilal Oswal, and Edelweiss. If you’re an amateur trader, then read this guide on currency futures trading again. Trust me, trading in the currency pair is a little bit tricky than trading in equity. You can share your thoughts and experiences in the below comments section. Like this post, then don’t forget to share it on your social networks.